Dire day for Tories – so why were the pundits hammering Labour? 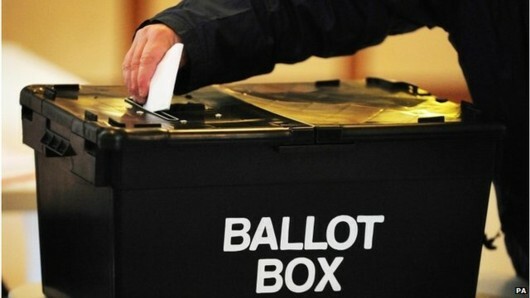 Own up: How many of you stayed up into the wee hours to watch TV coverage of the local council elections? If you did, you would have witnessed a curious phenomenon. As the Conservative Party lost seat after seat (at the time of writing they have lost 113 seats altogether) and Labour won seat after seat (currently 125 seats better-off), the pundits sitting around David Dimbleby on BBC1 started telling us this put Labour in the poor position! This, we were told, was because UKIP’s performance heralded the arrival of “four-party politics” – but does anybody believe that? UKIP won protest votes against the UK Coalition government’s policies at a time when elections to the European Parliament were also taking place. Anti-immigration feelings have been stirred up and people have been led to believe – wrongly – that a vote for UKIP will cut off the flow. In fact, UKIP did damage Labour in areas like Swindon, where they took working-class votes and enabled the Conservatives to hold that council with a slightly increased majority. But the ‘Purple Peril’ did far more damage to the Conservatives, with Essex Man and Woman voting very strongly for it. What does this mean, translated to the Westminster Parliament? The answer is, it’s difficult to judge. Turnout was only around 36 per cent – half the number who take part in a general election – because faith in democracy is so low. This means any predictions are more likely to be wrong than right. … UKIP will do a coalition deal with the Conservatives because Nigel Farage wants a taste of power, and we’ll end up with five more years of David Cameron. We know they’re already talking about it because Michael Gove has denied it. To avoid this, Labour will have to consolidate its gains and show that it can make a real difference where it wins. A good start would be to cut the harmful social policies in Hammersmith and Fulham, which Labour took from the Tories last night. H&F was once dubbed David Cameron’s favourite council. Why? Well, a recent Guardian article showed that the council was selling off its housing stock at an increasingly accelerated rate, while forcing homeless people into temporary accommodation outside the borough. Ending this wrong-headed nonsense would be a good start. The new Labour administration could re-examine the planned closure of Sulivan Primary School in Fulham, which won an award from London Mayor Boris Johnson at the end of last year after it “succeeded against the odds in improving pupils’ aspirations and achievements”. According to The Guardian (again), campaigners fighting to save Sulivan say it has been targeted because there are plans to turn the site into a new Free School, part of Michael Gove’s silly pet project that has been haemorrhaging money. And Labour could halt the Earls Court Project redevelopment scheme, which will knock down elderly residents homes – buildings which are perfectly sound – in order to replace them with “impossibly expensive” flats. Labour would score hugely if it took a stand against this merciless money-driven destruction of a neighbourhood that belongs to ordinary people. Elderly people, in fact. Not only are they vulnerable; they are also voters. 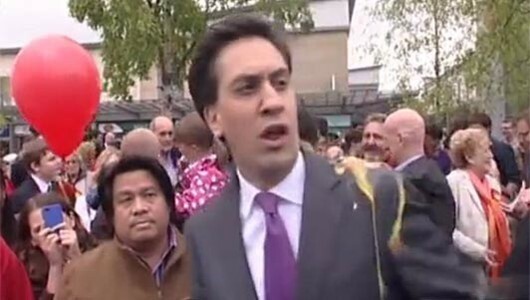 One thing’s for sure – whatever Labour does there, The Guardian will be watching! Results are still incoming from the council elections, so undoubtedly the ‘expert’ opinions will change before the end – and then we have the European election results to come on Sunday. A quick anecdote about that: Yesterday evening Yr Obdt Srvt was at a meeting on a completely different subject (a local festival here in Mid Wales – I’m the organising committee’s secretary). Afterwards I was chatting with a friend about the election when a young man approached us in search of the nearest polling station. My friend passed on the directions and the man thanked us and started on his way. “Don’t vote UKIP!” shouted my friend. “I won’t!” was the response. Three cheers for free speech! If you weren’t watching the BBC’s Question Time on Thursday, you didn’t miss much; questions about whether the young and poor should pay to maintain the lifestyles of the rich and old, and about whether the police should have shot unarmed Mark Duggan were deflected by Tory Nadine Dorries and Lib Dem Norman Baker – lamely, but that’s all they need to do with Dimbleby in the chair to protect them. Dorries reckoned Mark Duggan was seen with a gun in his hand and threw it away but my information is that no witness actually said this. If so, then she should have been corrected but wasn’t – that’s the level of information you get on QT these days. Then they moved on to immigration, and we got the wonderful speech by the lady in the YouTube clip above. She might not be the most sophisticated speaker ever to grace our screens but I, for one, don’t care a jot! She made a point that Dorries, Baker, and particularly Dimbleby – look at the way he tried to shut her down – didn’t want aired: That this government is using the non-issue of Romanian and Bulgarian immigration as cover for its real work – destroying the National Health Service and the welfare state in order to force poor people to take out inadequate insurance against poor health and unemployment instead. Let’s see more people doing the same on future editions of the programme. The Establishment (including the BBC) want to keep you quiet, so just go out and make sure these people fail. Show your support forVox Political. Even more cuts are needed, worth billions of pounds, and there are still huge underlying problems with the economy, said Sister George, even though he knows that cuts are not the answer. The small upturn he managed to engineer last year came from a natural upswing in the economy and the artificial housing boom that he created by Keynesian means and was nothing to do with austerity cuts. As for the economy, he’s had three and a half years to fix it! It seems clear that if there is an underlying problem, its surname is Osborne. We may also extract some bitter humour from his words. Only days ago, his cabinet colleague Michael Gove attacked TV comedy Blackadder Goes Forth for claiming that our leaders in World War One never learnt from their mistakes but merely repeated them, over and over again, at huge cost in the lives of the working-class people who had to suffer the consequences of their decisions. 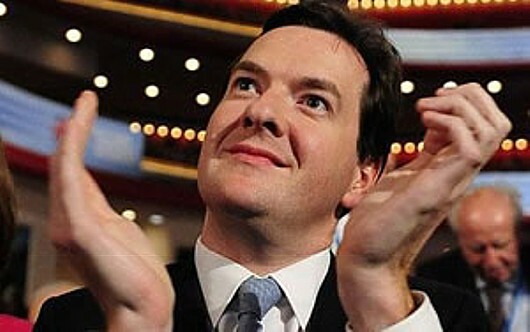 Now here’s George, telling us that he’s following up his failed austerity cuts with… more austerity cuts. So we will see another £25 billion cut out of the British economy after the next election if the Conservatives win, including £12 billion from social security, he told us, providing everybody with an income lower than £50,000 per year with a perfect reason not to vote Conservative in 2015. 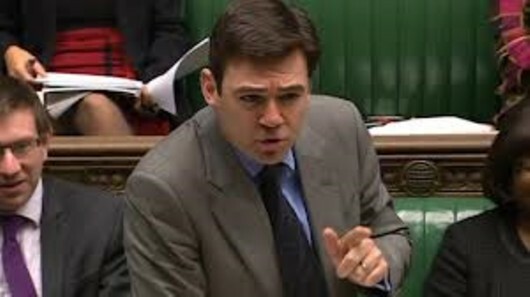 Come to think of it, why do working-class people ever vote for clowns like him? He’ll cut departmental budgets by £13 billion, starving already wafer-thin public services and paving the way for their takeover by the private sector – on the long-disproved premise that profit-making businesses can do a better job for less money. He’ll cut housing benefit for young people (under-25) who are just trying to get started in work – but he won’t force under-paying firms to boost their wages in order to offer a decent standard of living! He also said – no, wait, that’s all he had to offer. George justified his plan by trotting out the now-classic justification line of this Parliament – that the deficit was down by a third since 2010. He has been saying this for the last two years, and in all that time, the deficit hasn’t dropped at all! Last year the difference was a fraction of one per cent. This is because the drop was achieved by cutting capital projects and there aren’t any more to cut. Taking billions out of the economy with benefit cuts and investment cuts actually harms the economy – there is less money moving through the system and therefore less opportunity for the fiscal multiplier effect to take place, for profit to be made and for taxes to be taken. George has always had a bit of a blind spot there. Sister George said he supported universal benefits for the elderly as they will only save around £10 million – but Sister David has suggested cutting free TV licences, bus passes and winter fuel allowances. Pensions are also taking a battering – never mind what they’re saying about the triple-lock. David also said he wanted to cut taxes for the poor before the wealthy – but planned to do so by raising the threshold at which they begin to pay tax. This means they will not pay National Insurance either, and will have to find a higher-paying job before they can expect to contribute to their own pension fund. This means some people may never qualify for the state pension. So they’re starting 2014 by promising austerity cuts that will harm the economy, cuts in benefits for the elderly that will save a comparatively negligible amount but will cause misery, and cuts in government budgets that will open the way to further privatisation and corporatisation of the state. Those are the real hard truths – but you won’t hear these two characters admitting them. You can’t trust the mainstream media to debunk politicians’ lies; that’s why you need Vox Political! But this site needs YOUR support to continue. 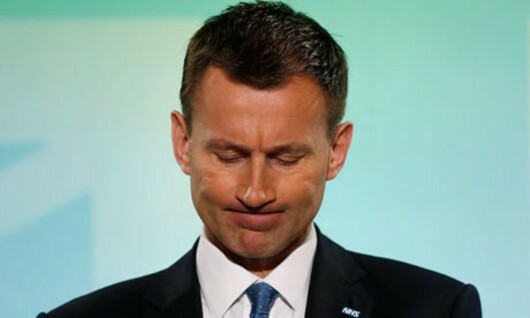 A time for silence: If Jeremy Hunt opens his mouth again, no doubt his own foot will go flying into it and he will need the help of NHS surgeons to remove it – if any can be bothered. Apparently they had enough trouble removing his head from David Cameron. 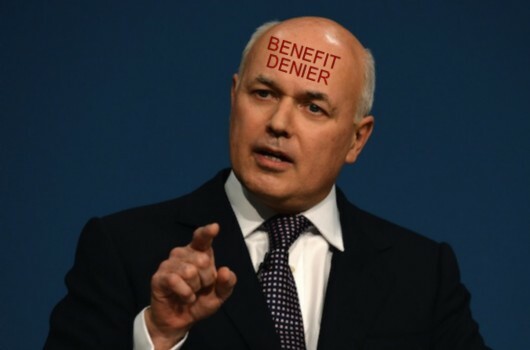 Hypocrisy, your name is… still Iain Duncan Smith, in fact. He doesn’t get off the hook just because Jeremy C… Hunt has put his foot in his mouth. Hunt does appear to be challenging LieDS for his crown, however. For those who aren’t aware: Back in 2005, the now-Health Secretary co-authored a miserable little screed calling itself Direct Democracy, in which he made clear some of his opinions about the National Health Service which was – at the time – getting some of the highest satisfaction ratings it had ever enjoyed. Let’s compare some of the things he had to say today, celebrating the health service’s 65th anniversary, and in the book. In his book, he wrote: “The NHS was designed over half a century ago, at a time of rationing and deep poverty. It was, and remains, a child of its time” [page 76] … “A 1940s monopolistic structure is no longer relevant in the 21st century” [page 80]. In his book, he wrote that it was “a fundamentally broken machine” [page 80]. Today, he announced changes for the vulnerable and elderly, adding: “this is only the starting point of a much broader transformation in ‘out of hospital’ care – one which will help every single patient and make sure the NHS stays true to the values that underpinned its founding in 1948”. In his book, he wrote: “We should fund patients, either through the tax system or by way of universal insurance, to purchase health care from the provider of their choice” [page 76] … “our ambition should be … denationalising the provision of health care in Britain” [page 78]. In his book, he wrote: “They are told that record investment has transformed the NHS; but their hospital seems as grimy as ever” [page 31]. What a load of hypocritical flannel. I’m fed up of these Tory wet-wipes trying to wash away what they’ve done in the past and thinking we won’t notice. James Naughtie had Hunt pegged when he came up with that profane nickname for him. The Health Secretary continues to live down to that nickname, every day of his life.